I was posting about our breakfast at Chokdee Dim Sum and Bak Kut Teh in previous post; after some shopping at 7-eleven, we were back to hotel to wait for the tour guide from JR Tour. He came on time and is able to communicate in mandarin (you can request a tour guide with your preferable language from the agency), in case you did not notice the price I posted in previous post, it was only around 2100THB for 5 pax and we went to 8-9 places in total, including the floating market! Worth-till-drop! The little danbo is quite lucky to join us for the trip, I always bring it along wherever I go even I didn't really use it as a prop to take nice photos. Maybe I should make a danbography wherever I go since now we do have legography from Andrew Whyte. Since most of the places we wanted to visit are near to Songkhla, which is quite far from the Hat Yai city (correct me if I'm wrong), so the first place we went is Wat Hat Yai Nai, which is 10-20 minutes from our hotel. Just to let you be prepared, most of the places we went are temples which are quite famous in Hat Yai, most of the tourists go to Hat Yai is to make a vow to god; you will impress on how nice they build the temples! Since it was the first temple we went, I decided to pray a little and donate some RM together with my bro-in-law. Met this little cute girl and her meows in the temple, cute no? After that, I felt asleep in the van as we traveled more than 1 hours to reach a small island in the Songkhla Lake which named Ko Yo. The temple we visited in Ko Yo island is Wat Phranon Laem Pho which has a massive golden reclining Buddha to welcome us. Was impressed by the golden reclining Buddha as it is so huge and pageantry, we spent some times to enjoy the weather near the lake. 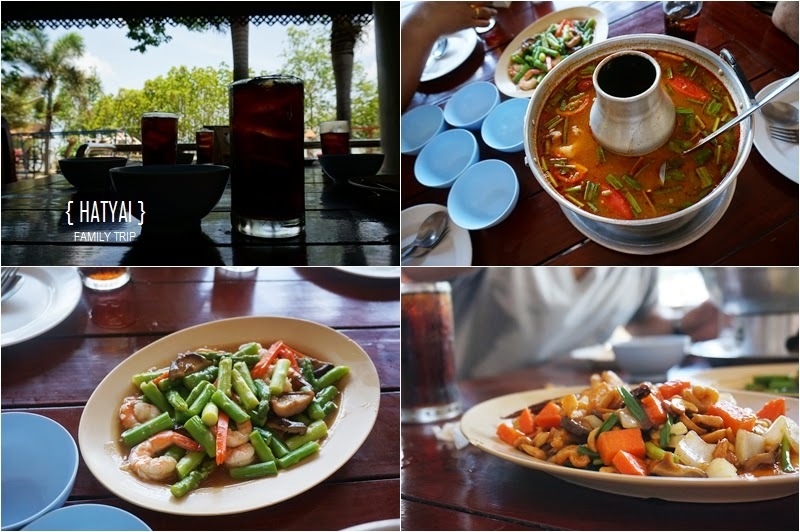 We were then went to the restaurant nearby the Ko Yo island to settle our lunch, we were still quite full with the heavy loaded breakfast, so we just ordered some dishes. Our tour guide was not joining us for lunch, as they have a special room for tour guide to dine I think; overall all the dishes are quite good but more expensive than the one we had in Kan Eng restaurant. The Songkhla Aquarium is inside our day tour list, even we were not planning to go in to pay a visit (it will draw most of our time), tour guide also must bring us to the places that listed, unless if you notice you are short of time to other places, you can request the tour guide to skip the place you do not want to go. We just went there to take some photos and some walk in the garden; for your information, the aquarium entrance fee is 250THB for childrens, 400THB for adults and 400THB for the Go-Kart (5 laps). We told the tour guide to skip the elephant ride since most of us are not interested on it under the hot sun. He was then brought us to Naga Head at Song Thale Park, one of the attraction for Songkhla Lake and it was constructed in Year 2007. The Naga Head or "Nag" (Naga means dragon in Malaysian and Thailand language) is said to symbolize wisdom and intelligence. Talk about this Naga Head, it is actually separated into 3 parts, the head (which shown in the photo) is at Laem Son On Dam, the body is in the Lan Chom Dao, which is near to the lotus pool, and the tail is near to Songkhla Golf Course. The head and tail are about 3km apart! The way the sculptures are meant to evoke the image of large dragon moving its way through the city, too bad I couldn't find its body and tail in the garden! Laugh. Feel lucky that we are back from Hat Yai already! Till then.